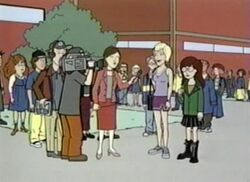 "The Lost Girls" was the fifth episode of the third season of the Daria TV series (episode number 305). It first aired on MTV on March 24, 1999 and was written by Neena Beber. Timothy O'Neill, unknown to Daria, enters her essay, "My So-Called Angst," into a contest to "Win a Day With Val," the vapid editor of the equally vapid Val Magazine. Daria is, shall we say, less than enthused, as she believes Val is essentially a narcissistic opportunist making money off the confusion of teenagers and foisting her own shallow beliefs on them (cos Val is); Jane, however, convinces her to go along with it, saying that the experience could be an opportunity to snag a trip to New York City. At school, which has 'coincidentally' decided to have a Color Day on the same day Val will be around, Daria endures Val's incessant chatter, openly fake claims, and over-the-top efforts to fit in with the youth culture she supposedly represents. (Val, for her part, endures the fact she's got to follow Daria around and not a more popular girl like she hoped for - at one point forgetting who Daria is.) At one point, Val manages to hijack O'Neill's class from him. A minor crisis happens when, mid-meeting with Angela Li (who is desperate to get her Val's signed), Val's boyfriend breaks up with her after getting "Gwynie" pregnant - Li and Daria sit in mortified silence. Finally, Daria - whose notes have been "What am I doing here? How am I going to get through this? Dear God, help me." - can take no more, and essentially tells her that she should "get in touch with the 30-something without", grow up, and start doing more to help today's youth with their problems instead of adding to them. Enraged, Val leaves and, upon returning to New York, writes an article for Val about "today's underground bummer culture"... with Daria as the "anonymous" subject of the article. The episode is ripping the piss out of Jane Pratt and her self-titled magazine Jane Magazine. Pratt herself was a good sport about it and in 2010 contributed a tongue-in cheek question, "would you parody someone now in order to make a social statement? ", to a Tracy Grandstaff interview. In 1999, MTV's episode guides called it "a "Savvy" - like teen magazine" as a cover. The later website feature "Guestward Ho!" nodded to the real source: "Reminiscent of a real-life editor who named a magazine and a talk show after herself. (But her name has four letters, so it's so totally not her!)" Principal Li is a fan of Garth Brooks - Val doesn't know who that is. The title of the episode is a play on the title of the 1987 film The Lost Boys, while the title of Daria's essay is a play on the title of the television series My So-Called Life. The song that Jane sings while passing Daria and Val in the school hallway is "New York, New York" from the Broadway musical On The Town, lyrics by Betty Comden and Adolph Green and music by Leonard Bernstein. The ghost story "Letting Go" (Part 1, Part 2, Epilogue by RX-87 starts with Val driven to suicide by the events of this episode. Kristen Bealer's fanfic "The Double-Crossed Girls" has Quinn winning the "Spend a Day with Val" contest with her essay instead of Daria. This page was last edited on 24 April 2018, at 13:20.